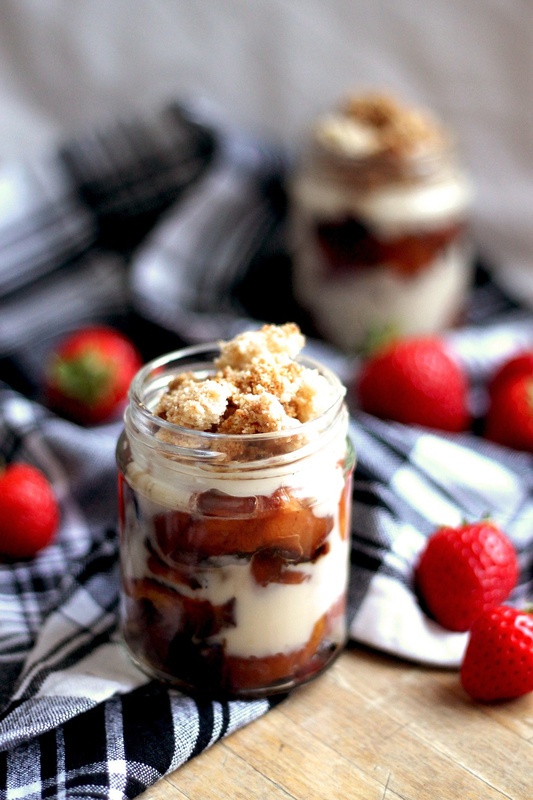 Perfect for al-desko/fresco lunches, suppers or a particularly indulgent snack... No matter the time of the day, those crumble in a jar are just peachy! Peel and chop the fruit, then place into an oven-proof dish. Drizzle with honey and bake until soft (about 35-40 min). In a large bowl, combine the butter, sugar and flour into a fine crumb. Place onto an oven tray and bake until golden (about 20min). Heat up the milk with the vanilla pod until just boiling. In the meantime, mix together the egg yolk, sugar and corn flour. Pour the milk over the egg mixture and stir well. Return the mix into a clean saucepan and cook gently over a low heat until it thickens. Layer the roasted fruit and custard into small (8oz) jars. Pop the lids on and store the jars in the fridge until you need them. Top with a layer of crumble and serve immediately.